HJ: The passage of time is directly controlled by your perception of it. That is because, in fact, linear time as we know it does not exist. There is only an ever present now moment with movement and growth and birth and decay of organisms and objects, which gives the false impression that time is moving forward. The fact is that everything is ever evolving in a simultaneous now moment. Therefore the passage of time only exists as a facet of your perception, meaning that you have full control over it’s speed. Below you will find some methods for altering the perceived speed at which time passes, thereby becoming a master of time. It is said that time, as we generally understand it, is a phenomenon of the third dimension. As we evolve to a higher consciousness and higher dimensions, many of us are starting to experience time in a different way, as the mental concept that is time slowly breaks down. Time speeding up, ‘lost time’ and time standing still are becoming more frequent amongst those on a spiritual path. Loosening the grip that time has on us could assist us with expanding our consciousness and therefore our spiritual evolution. Ancient civilisations would track long cycles of time based on the position of the Sun, the Moon, planets and stellar constellations. Agricultural communities track shorter cycles of time with the seasons. Tracking time in hours and minutes as we constantly do in our society is as recent as the Industrial Revolution. Almost everything we do in our lives we do to a schedule of time and the weight of constantly tracking to time can become a burden on us. This can also lead to anxiety from stressing about time. It is understood that happier people generally do not stress about time. Time is a left brain concept, and we track time with the left side of the brain. Creativity is a right brain activity, and does not come on and off between certain hours – therefore, we lose our creativity when we focus on time. Stop wearing a watch. Many people no longer wear a watch because they carry a mobile phone which has a built in clock. But there is a symbolism in not wearing a watch, that you are not tied to time. My experience is that many lightworkers no longer wear a watch unless it’s necessary for work. Don’t set an alarm to wake up in the morning. This may be a little tricky for many to get to work in time. So, on those days when you don’t have to get up at a certain time, take back control and just wake up when you are ready. Do things when you want to. For example, if you watch television, usually you do this when the show you want to watch is scheduled. But there are options now to watch shows online when you want to. Break the routine that time holds on you. Eat when you want to rather than because it is the scheduled meal time. Go to sleep when you want to. When you meditate, all external influences float away, including time. Meditation is a great way to liberate the mind from time (as well as reducing the stress from time). Get natural light whenever possible. You have a built-in day clock known as the circadian clock. It is set by natural light, so the more you are in natural light (and natural dark) the more you will be in tune with your natural rhythms. Do something creative without a time limit. Creativity comes from the right side of the brain, while time is tracked by the left side of the brain. The two do not go together. Live in the now moment. Try to think less about the past and worry less about the future. 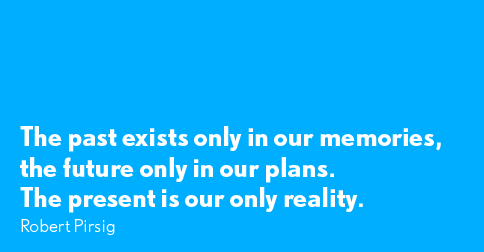 Just experience the present. When we dream during sleep, a dream can seem like it lasts for hours or days when in fact it is just a few minutes. Time is different. This is so with daydreaming too. As long as you watch time, it goes fast and there is never enough of it. Free yourself and you will have more time and more happiness.